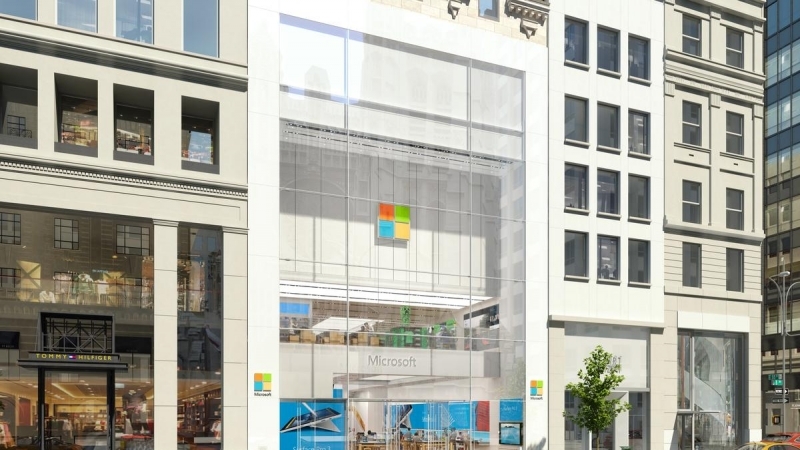 Microsoft is set to open its flagship store on New York’s fifth avenue today, just a few blocks from Apple’s famed glass Cube store. In an effort to attract crowds, the Redmond, Washington-based tech giant says at least the first 1,000 people in line for the opening of the store will receive two free tickets for a concert taking place later that evening featuring rapper Pitbull. Since 2009, Microsoft has launched over 110 retail stores in United States, Canada and Puerto Rico, but none can match the size of this five-floor, 22,269-square-foot New York flagship. It will feature 198 LCD monitors, a 30-foot, two-story monitor tower with 36 monitors, and 36 video walls that measure 50’ by 5’8” each. It will also have 160 employees and space for up to 60 guests to hold workshops and training sessions. None of the numerous devices on display in the store will be tethered to the tables, as visitors are encouraged to pick up the laptops and phones in order to get a better feel for them. There’s a station for playing Xbox One games, and several stools and tables dotted about for people to sit down and get some work done. With its close proximity to Apple’s own flagship store, Microsoft is no doubt looking to challenge the Cupertino-based company's dominance in the area of retail outlets. Apple’s 460 stores generate $4,798.82 in sales per square foot on an annual basis – the highest of any retailer in the US and way ahead of its closest rival, luxury jeweler Tiffany & Co, which generates sales of $3,132.20 per square foot. The store’s senior manager, Bill Madden, declined to comment when asked how much revenue he expected Microsoft’s new store will generate. Today is a big day for Microsoft; not only does it mark the opening of the New York flagship, but it's also the first day that the new Surface Pro 4 and Surface Book devices are available for purchase. Additionally, the store will hold a midnight launch event for Halo 5: Guardians. The company is set to open its first international flagship store in Sydney on Novemeber 12 this year.